[Riding boots with spurs, c1915-1919] Collections CCGW/CCGG. For those of you who follow us on Facebook, you will have seen these boots already. We received this pair of Canadian First World War era riding boots last week, complete with Canadian army marked spurs. 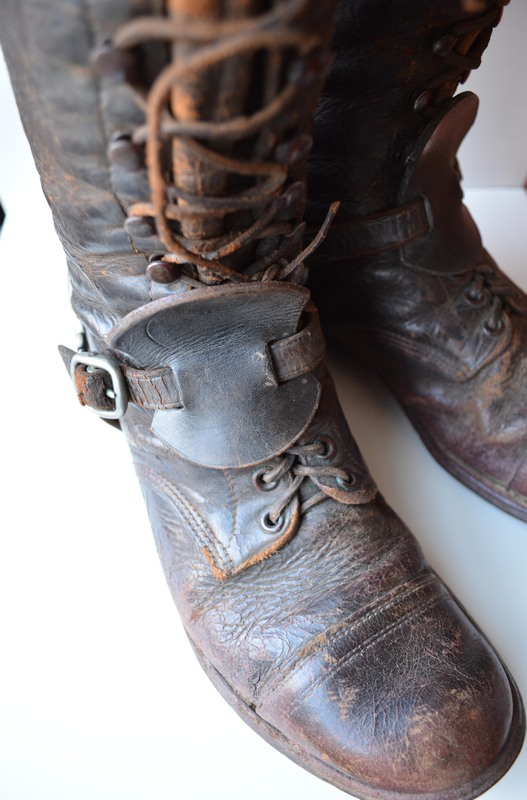 Though these boots may have been worn by a member of the cavalry, it is more likely that they were property of a soldier working in horse transport; either with the Canadian Army Service Corps or the Canadian Field Artillery. The common image of the First World War is that of machines and mechanized warfare, which, in the field of battle is certainly accurate. Cavalry units, like the 5th Canadian Mounted Rifles, were quickly dismounted at the beginning of the war, with only a handful fighting mounted for the duration. Cavalry and cavalry charges had no place in an artillery war, and the damage that could be done by a single machine gun to a mounted unit was considerable. However, the horse and the mule were still critical to the war effort, but in a different capacity. Heavy draft horses, ponies and mules were used by all sides to haul supplies, ammunition and carry out the wounded. Even with the introduction of motorised transports and their increased use later in the war, there were any places that a truck simply could not go. As a result, horses, and the soldiers who cared for them, spent the war dangerously close to the front lines. Canada sent over 130 000 horses to the Western Front during the war, ultimately supplying about 10% of the animals used by the British Empire. Most were requisitioned or bought from farmers and passed through the Bickerdike Yards in Lachine, Quebec, before being shipped by boat to France. The death rate for horses was extremely high; they worked in terrible conditions and were frequently targets for shell fire as they carried critical supplies to the guns and the fighting soldiers. The soldiers who worked with the horses, like New Brunswick lumber worker James Robert Johnston, usually had some kind of pre-existing ability with them. Many were former saddlers, blacksmiths or farmers, though some soldiers found themselves working in horse transport with no prior experience at all of how to handle them. Like their care-givers, horses suffered shell shock, and many were sold off to the Belgian government for slaughter after the war, as it was thought that they were too damaged to ever be useful in civilian life. One horse who did return to Canada was Morning Glory, the personal mount of Lt .Col. George Harold Baker of Brome, Quebec. Baker, commander of the 5th Mounted Rifles, went to the war on foot and was killed, but Morning Glory survived the entire conflict to return to Brome in 1918. She lived a long life and is buried at the Baker family summer house. Johnston wrote a memoir that was published posthumously by his family in 2012. Riding into war: The memoir of a Horse Transport driver, 1916-1919 is available from Goose Lande Editions in Fredericton, NB. My grandfather’s first cousin, Henry Douglas Smith of Winnipeg, was the Chief Veterinarian of the CEF. Although I’m sure his service was entirely in England at the headquarters of General Sam Steele, I am eagerly awaiting the digitization of his service record to see if it contains any interesting stories from his military career. Thank you for your comment Nancy! The digitisation is slow, but they’re getting there. We’d be very interested to know more about Henry Smith’s story as well.